If you live in the Austin, TX area, I’m delighted to visit your school or group. I can talk about how Grendel’s Mother came to be written, about the Anglo-Saxon period, about Beowulf and John Gardner’s Grendel, and other medieval topics. I can do a reading with selections from the published volume. I can also give a writing assignment in class for students to do, such as facilitating participants’ creation of their imaginative response to Beowulf. You can let me know what you would like. Here are some of my past readings. 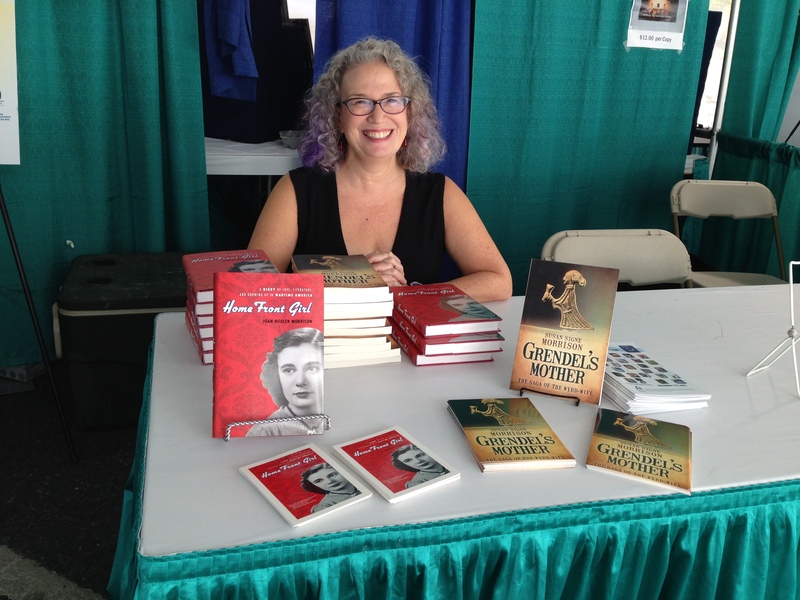 Here I am at the Texas Book Festival. Read more about it here. Before I come, it would be best to have assigned the book to your students and have had them read it. I am an English professor and know that if the students haven’t read the material, they can’t really say anything! I can visit schools, colleges and universities, conferences and book events. To read about an event at a high school, please read more about it here. 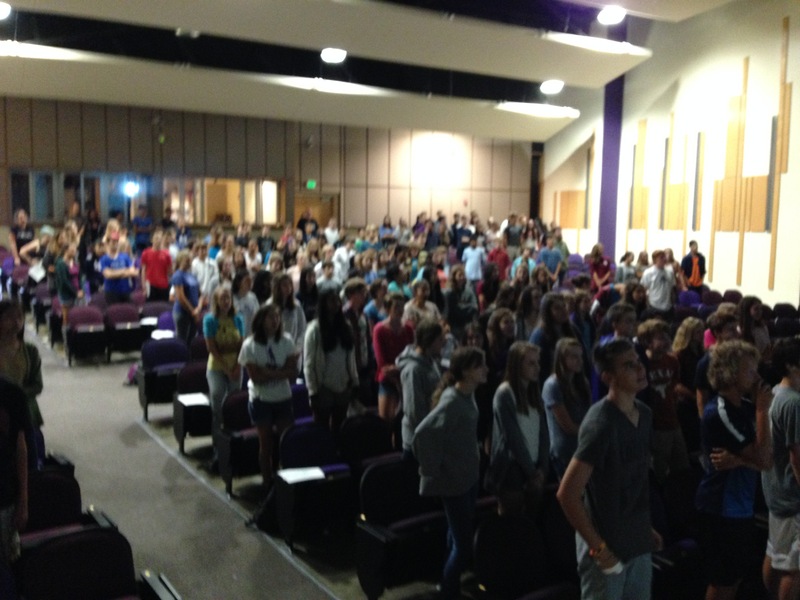 Lots of freshmen eager to recite Old English. I’ve won a number of teaching awards at my home university so my love of teaching and interacting with students has been recognized. I can facilitate readings, workshop writing, discussion, and learning. If you invite me, I would ask that you pay an honorarium, transportation costs, hotel and food expenses. If you want to coordinate with another school or group, that would less your travel costs. If you don’t live in Austin and your class is reading Grendel’s Mother, we can arrange for a skype visit. Just contact me and I’m happy to help your students! You can order books through my publishers or a local bookseller in advance of my visit. And of course I’d be delighted to sign books! Please contact me here to find out about my schedule, fees, and to let me know what you are interested in for your invitation. You can write to susansignemorrison at gmail dot com. To buy the book, see this page for information about distributors. My book launch was at Malvern Books on Oct. 22, 2015. You can read about it here. Below is a video of the marvelous Sarah McSweeney, who set one of my poems from the novel to music. At the Travis Heights Art Trail in November 2015. This was the Literary Coffeehouse portion. My colleague and wonderful poet, Cecily Parks, reading from her book, O’Nights. Here I am reading in on a rainy day in front of a cozy fireplace at the home of Vivian and Jimi Ballard, the elegant B & B, The Fairview. 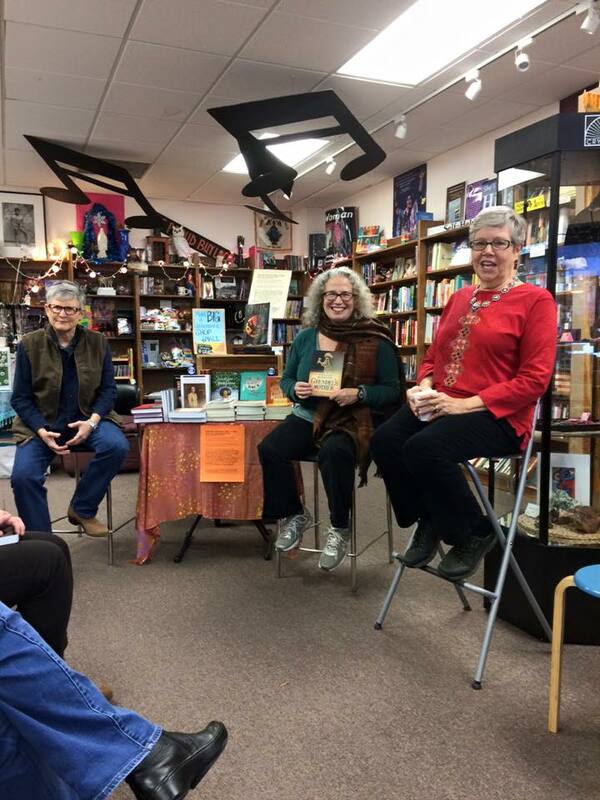 The Shop Small event on November 28, 2015 at BookWoman in Austin. Books of the authors at this lively event. Here with the fabulous Debra Winegarten! The mesmerizing and compassionate Issa Nyaphaga. So fun to go to book events. Here I am with Mary S. Black and Catherine Musemeche. 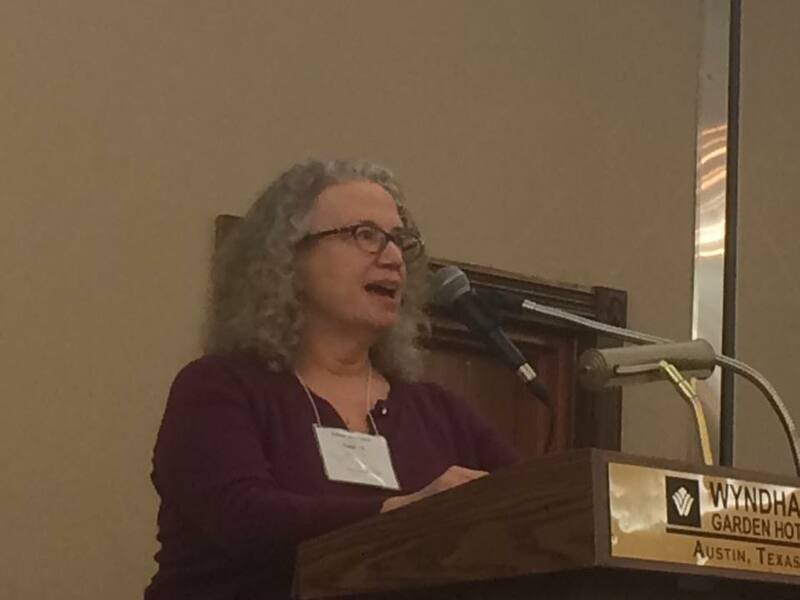 Photo by Debra Winegarten who also spoke about her books. 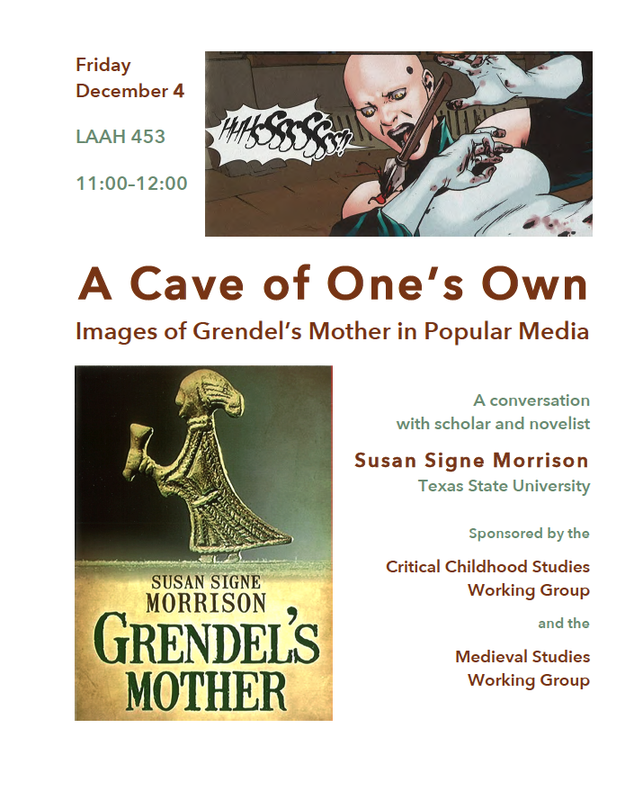 I had a great time talking about Grendel’s Mother at Texas A&M University in December 2015. I got to see some chums there too! Dr. Claudia Nelson and me on the campus of Texas A&M. Great to see my dear friend! Dr. Britt Mize of Texas A&M University. Well, I didn’t see Grendel’s Mother in the flesh….From Gareth Hinds brilliant and sumptuous graphic novel. 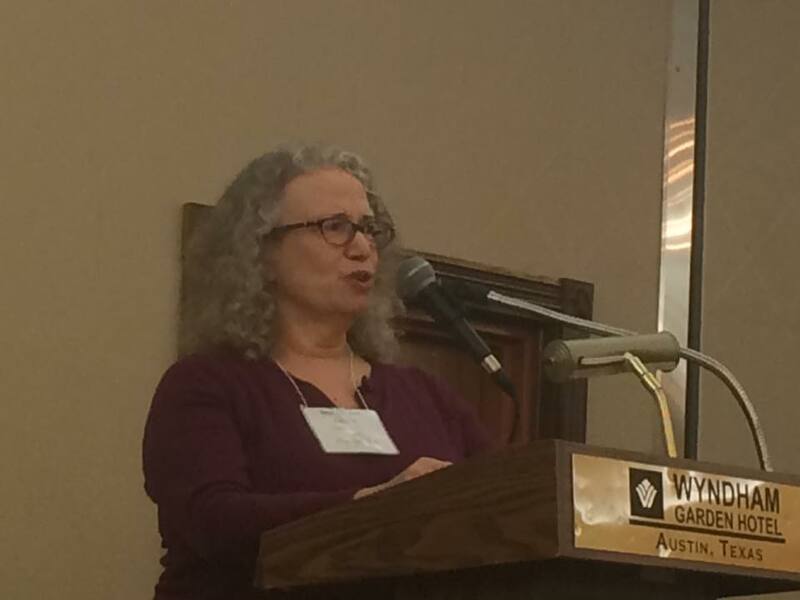 And then I had a fun time at the Modern Language Association convention (Austin, January 2016) reading with other “Medievalist Poets” in a session organized by the dynamic Jane Chance! Jane Chance wrote the first feminist article about Beowulf. The Story Circle Network Conference for women writers takes place ever other year. I look forward to it the moment the previous one ends! I’m with supportive, sassy, and spirited women for 3 days. All the while I’m making new friends, learning craft, and sharing wisdom. This year was especially sweet, because Grendel’s Mother: The Saga of the Wyrd-Wife was a finalist for the 2014-2015 Sarton Literary Award for Historical Fiction. I got to meet my fellow finalists and winners, hobnob with brilliant speakers and writers, and–oh yes–wrote! First, a lovely time have a drink on the first evening with my fellow honorees. 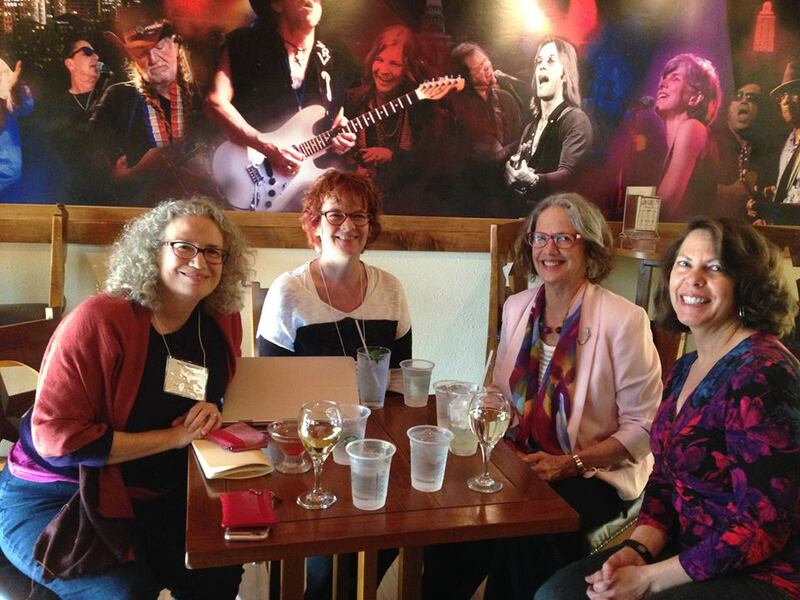 Susan S. Morrison, Jill Kandel, Tammy Hetrick, and Barbara A Stark-Nemon. 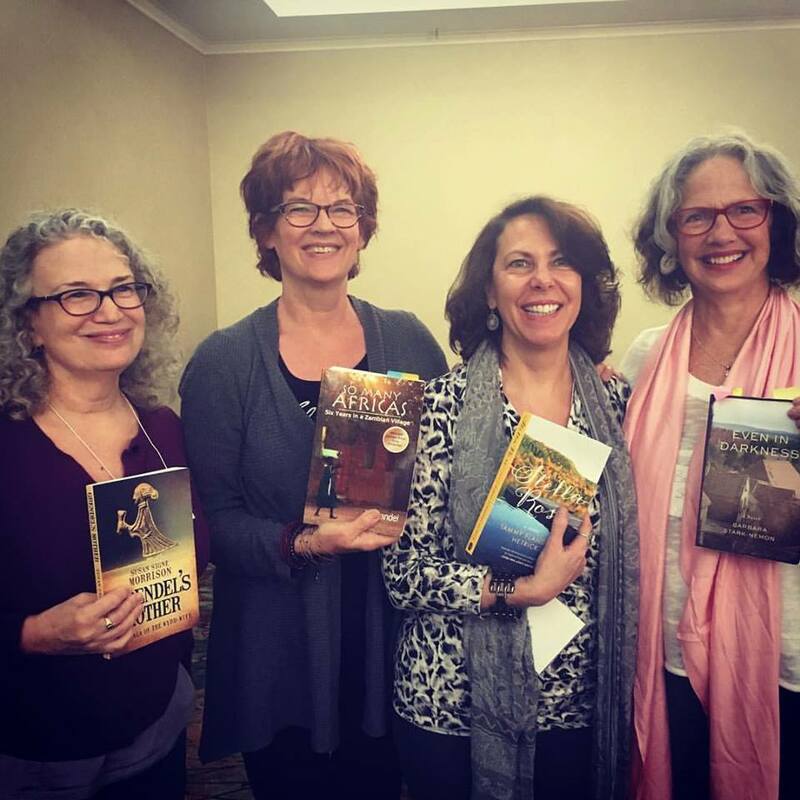 We had a roundtable chaired by the generous dynamo, Susan Wittig Albert, about the process of writing our honored books, the process of publication, and a discussion of our next projects. 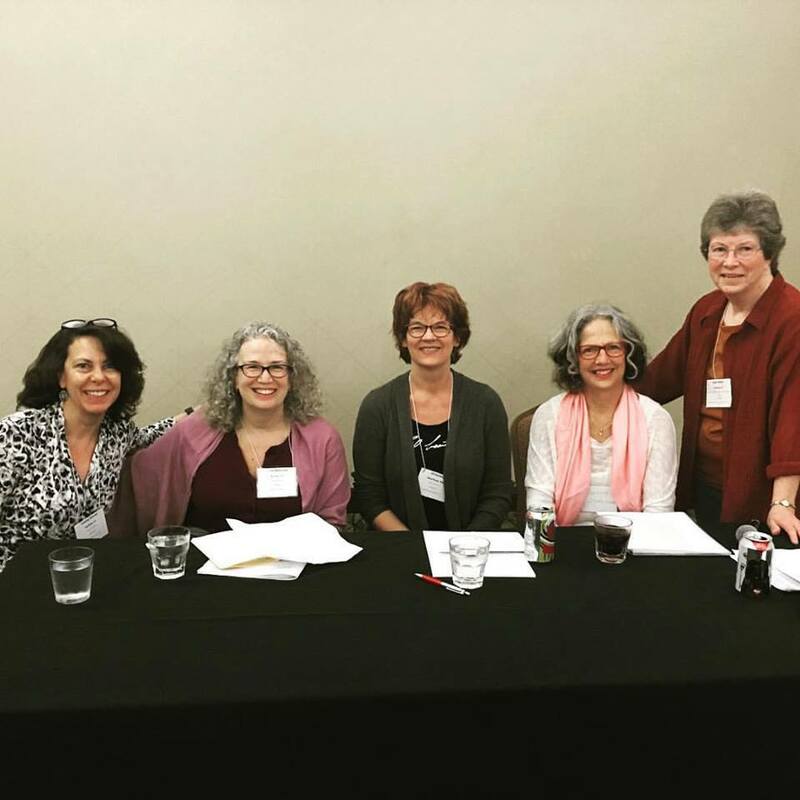 Tammy Hetrick, Susan S. Morrison, Jill Kandel, Barbara A Stark-Nemon and the ever generous Susan Wittig Albert who chaired our panel of the Sarton Award Finalists and Winners. We all read from our books at the luncheon on Saturday. Me reading at the Story Circle Luncheon. Me reading at the luncheon–getting dramatic here! In addition to making friends, I also loved how we ladies took over the men’s restroom at the hotel! Why I love Story Circle. 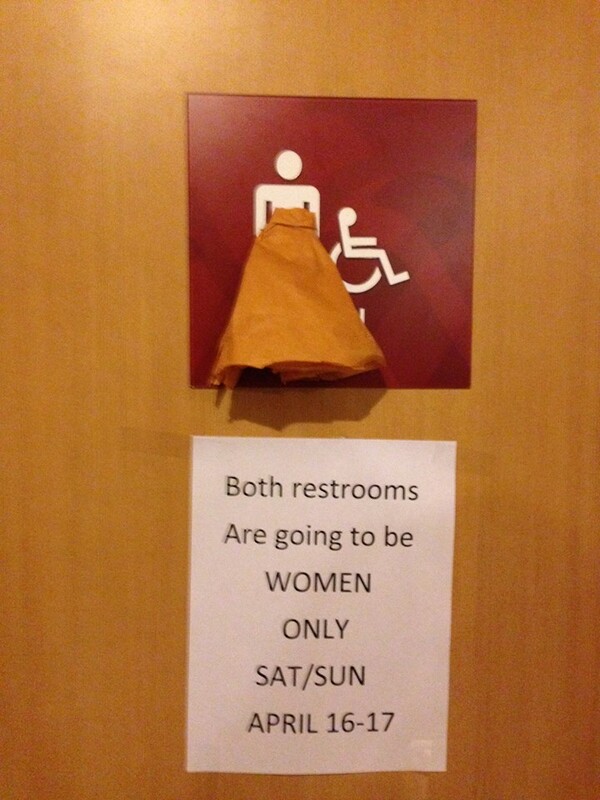 Over 100 women–taking over the men’s restroom! 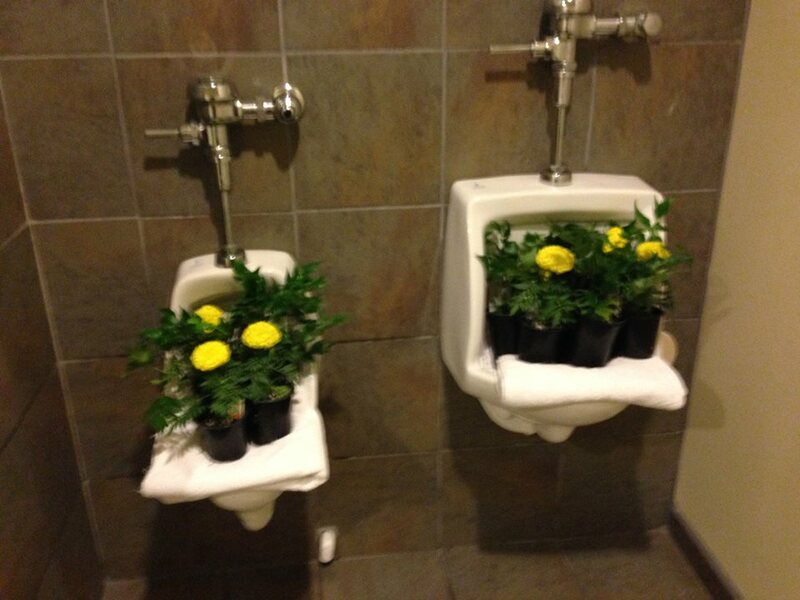 Mums for Moms and sisters in the urinals of the men’s room! Can’t wait until the next conference–in 2018. Now…I’d better get writing! 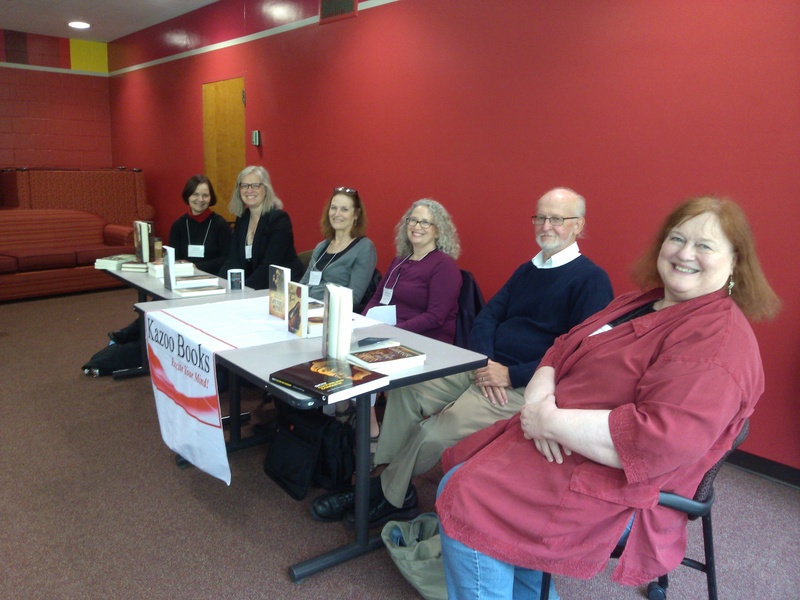 I was honored to be join a number of medieval novelists, at the 51st International Congress on Medieval Studies, an annual conference that takes place every year at Western Michigan University. I participated in the noontime brown bag lunch for medieval novelists who have a Q & A, hosted by Gloria Tiller of Kazoo Books. Writers interact with an audience of novel-reading enthusiasts. In the past, I was just sitting in the audience. It was a thrill to be sitting among these wonderful fellow writers! From l. to r. Candace Robb, Lucy Pick, Grace Tiffany, me, Mel Starr, and Sharan Newman. Photo by Todd Toussaint at Kazoo Books.